PITCH 'N PUTT FOR STUDENT SCHOLARSHIPS BREAKS RECORD! Each year, Multnomah Educational Service District Outdoor School current and former staff, with support from Friends of ODS, hosts a golf tournament to raise funds for college scholarships for volunteer Student Leaders. Student Leaders are exceptional high school students that give a week or more of their time during the school year to teach, lead, and mentor youth at local Outdoor School programs. On May 11, the Pitch n’ Putt FUNdraiser Tournament was held at McMenamins Edgefield and raised $7,467, blowing past a $6000 goal and raising $2000+ more than last year. Not only is the golf tournament a time to raise funds to recognize and support the college education of some excellent Student Leaders, the players have a BALL! 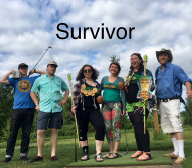 Two awards are presented at the end of the day: a Team Unity Winner, which went to Team Survivor, and the GLOAT Award (for most money raised), which went to the Grass Holes team. Thank you to all who donated! If you missed the chance, you can still support scholarships!